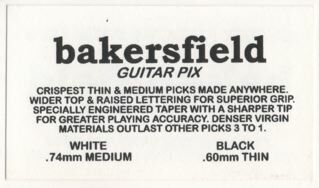 I recently had the pleasure of interviewing John W. Goode, who had acquired production rights to Bakersfield guitar picks from 1990 to 1997, until Jim Dunlop took over production, and soon after, CEASED production of them. John acquired productions rights from Rudolph Scaffidi in 1990. He explained that '1st Generation' Bakersfields(which were the same material and design as the Mosrite/Venture picks) were black and made of DuPont's 'zytel' material. In fact, when thre Mosrite Company went bankrupt, Scaffidi changed the name in order to continue production. The name 'Bakersfield' is simply named after Bakersfield, CA, which is where the Mosrite business was located. These picks are easy to identify, as they had three letters on the reverse, printed vertically down the pick for grip purposes. The letters? 'mia'. John told me that Rudy said the particular letter selection meant nothing in particular, but that he found those particular 3 letters gave the best 'grip' for playing. John explained that the 'mia' picks' were "from the very first tooling". These picks were made in 1968. The black pick was only available in .60mm gauge. The '1st Generation' white 'mia' pick was made of delrin, available only in .74mm gauge, and made in 1969. '2nd Generation' Bakersfields are easily identifiable by the reverse side of the pick as well. Flipping the pick over will reveal an uppercase 'B' with two verticle lines below it, produced in 1980, and made with injection-molded tooling as well as zytel and delrin. These were also made, for a short time, in coral pink and blue colors. The coral pick was of the same gauge as the white-.74mm. However, the coral and blues were "produced with a re-grind method", Mr. Goode explained and elaborated, "Re-grind is basically 'surplus' plastic, sort of the scraps from unrelated products which were re-ground and melted down". Though the surplus material was still DuPont Zytel and Delrin, John told me he never used the 're-grind' method due to it not being "virgin material so it would tend to wear out faster from multiple heat-cycles in the injection molding process.". Humorously, he explained, "My longtime bass player since the 80s, Bobby G. Riddle, loves those damn coral picks. He loves the way they play when they wear, leaving orange dust all over his bass!"